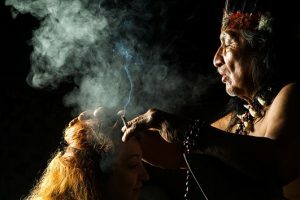 This 8 month Shamanic Apprenticeship will set you on your path as a Shamanic Practitioner, based on the Pachakuti Mesa tradition (with its roots in South American/Peruvian Shamanism), with some aspects of Native American shamanism covered. This program requires serious dedication and an openness to your own personal healing and transformation that will occur throughout its duration. It is not for education purposes or to simply 'learn' about Shamanism - it is to train you in becoming a Shamanic Healer & Practitioner. It will require acquiring several items over the course of the program to be used in your practice and they will need to be brought to class as time goes on. Different methods of Shamanic Journeying & understanding of the "three worlds"
Shamanic healing techniques and ceremonies including Soul Retrieval, Extractions, Cord Cutting, energy clearing & healing, Power Animal Retrieval, Bands of Power, shapeshifting, Psychopomp, weather shamanism, creating protective talismans, and much more. You will give and receive several healing ceremonies and techniques with the other students in the program. When you complete the apprenticeship, you will be fully prepared to start your path as a Shamanic Practitioner. We will have some weeks off for holidays. Make-up classes are available if emergencies arise. Register now to save your spot for the 8-month apprenticeship. Class is limited to 6 students. Down payments are non-refundable. You must be dedicated to completing your apprenticeship.